Dividing polynomials using the box method is actually a really great way to save yourself a lot of time. Divide polynomials using the box method with help from an experienced math professional in this free video clip. How to divide polynomials using the box method? 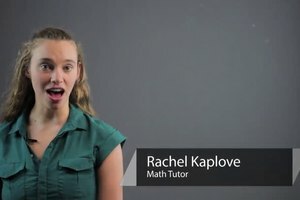 My name is Bon Crowder and I'm with MathFour.com. And we're going to divide these two polynomials using the box method. So, here I have my boxes laid out and if you'll notice, they're color coded. Because what I'm going to do, is this, the 12-X cubed goes here. And what I'm going to do is, have this piece along the side. And I'm going to treat this kind of like a regular multiplication table. So, here's the answer in a sense, and I need three-X times what, gives me 12-X cubed. Well, three-X times four-X squared, gives me 12-X cubed. Then I look at this and go, well, gee, four-X squared times negative two gives me negative eight-X squared. But this 23-X squared needs to be these two put together. So, negative eight-X squared plus what, gives me negative 23-X squared, negative 15-X squared. So, then I look and I go, gee, three-X times something gives me 15-X squared. Three-X times negative five-X gives me 15-X squared. And then, I look to the next, again it's just like a multiplication chart, down and across. Negative five-X times negative two is ten-X. But here we go again, we need the 10-X to combine with this other blue box to give me 13-X. So, that's three-X. Then I need to know, well, gee, three-X times what, gives me three-X. No, this three-X times what, gives me this three-X? They're the same. So, I need a one there, because one times three-X is three-X. And then, I multiply one times negative two and I get negative two. Is that the same there, sure is. So, which means my answer to the whole problem is this piece across the top. Four-X squared minus five-X plus one. And that's my answer. And that's how you divide polynomials using the box method. 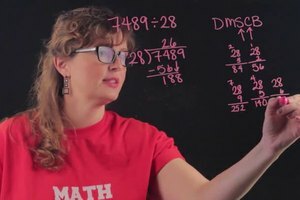 I'm Bon Crowder with MathFour.com, have fun with it.